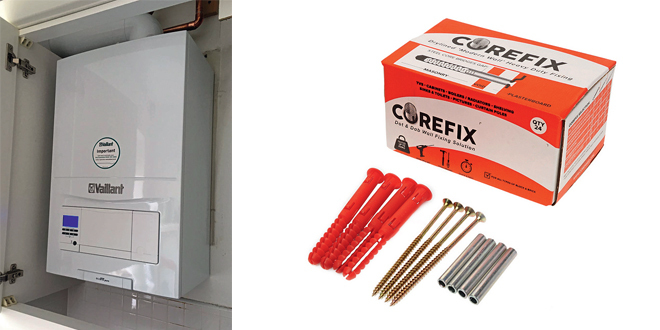 Corefix is a unique heavy duty fixing system for dot and dab wall construction, a method used almost exclusively in the UK’s new build homes. Obtaining a secure fixing to a drylined wall is notoriously difficult. Corefix solves this problem by securing the load to the solid wall behind, and not to the plasterboard, so unlike traditional frame fixings won’t deform or crush the plasterboard into the void. Initially designed for hanging heavy kitchen cabinets, it is now widely used in the plumbing and heating, kitchen, bathroom and DIY sectors. Developed with installation speed in mind, each three part set can be fitted in less than a minute with no specialist tools required. A drill, hammer and screwdriver are all that are needed. To install, drill a 10mm hole with a masonry or SDS bit to the depth of your red or blue Corefix plug, tap this home until the flange touches the plasterboard, tap home the engineered steel core until this is flush with the flange of the plug, offer up the bracket/fixture and screw home until tight. Available in three ranges Corefix original, for all block and brickwork, Corefix Air, for lightweight thermalite blocks and Plus30, with a 20mm longer screw for deeper brackets and fixtures (on the outside of the plasterboard). Corefix has been independently tested for both sheer and tensile strength in all brick and blockwork substrates. It has been tested to over 250kg on four fixings, enough to support even the largest radiator, boiler, TV, wall cabinet and all wall-mounted sanitary ware. The original and Plus30 products carry a safe working load of 100kg whilst Corefix Air, carries a 73kg safe working load. With a precision engineered plug and steel core, the system transfers the majority of the load away from the plasterboard and ties this into the solid block or brickwork behind, giving total peace of mind. “I saw Corefix at Installer2018, and was very impressed with the design and thought it was reasonably priced. It is very effective and gives fantastic support, bridging the gap on a dot and dab wall and saving time because you don’t need extra support. I was particularly impressed by how solid the fixings held considering they were supporting a boiler, which was 35mm away from the surface it was fixing onto. “I used the Corefix fittings while mounting a uni-strut to support a low loss header and I was impressed. “It’s the best fixing of its kind that I’ve used. They are very strong and didn’t distort the plasterboard on the surface at all. I only used them on medium weight items, not on rads/boilers yet, but I’m sure they’ll be up to the job. “I used them to hang a 42kg vertical radiator on a drylined wall and the fittings were very good, with nice simple instructions. I was most impressed with the simplicity of the fittings, they’re very effective and strong, I dropped the rad on and they didn’t move at all. “I was fitting a decorative radiator in a property and the wall was dot and dab. The weight of these radiators is always a concern, but the Corefix fixings put this issue to bed. They are fitted like a standard brick wall fixing, but the metal bridge piece solves the dot and dab problem.